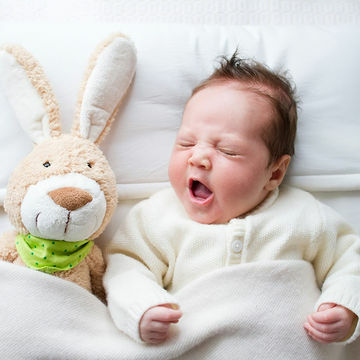 From an Easter basket fit for a tiny one to an adorable bunny costume, here's how to make the most of Baby's first-ever Easter holiday. It's guaranteed to be cute. You hatched the cutest egg you've ever seen (sorry, we had to), and now it's time to celebrate baby's first Easter. Even if she's too little for the candy or the (sometimes scary) bunny at the mall—there are so many special ways to spend this spring holiday with an infant or toddler. From outfits that are worth the splurge to photo ops that only come around once in a lifetime, try these five ideas. Even if your little chick can't fully appreciate receiving a basket full of goodies from the Easter bunny, it's still a fun chance to make her smile. Fill one up with the things she loves: those puffs for on-the-go eating if she's on solids or books, plush toys and a themed bib for the earlier days. Just think how cute she'll look sitting next to a basket that's as big as she is! Depending on how small your babe is, it might be tough to lug around all his things to a restaurant or someone else's home. Use your new mom status to your advantage and invite your family and in-laws over for brunch at your house. Since you'll need time to prepare food, we bet Grandma won't mind getting in some snuggles with your little egg while the bacon is cooking. Or, better yet, get Grandma to do the hard work while you take a nap. Since baby makes three, it's a great time to talk with your partner on how you want to celebrate Easter moving forward. Will you go to church? Dye Easter eggs the night before? Host the Easter egg hunt for the family and cousins at your place? Once Baby has (finally) fallen asleep, take a moment to figure out what family traditions will matter the most to your new clan. Easter is all about new beginnings and it's those first few glorious days of beautiful spring sunshine. If you have a backyard, patio space or even kitchen garden—pot a tree or a plant. Each year, you will watch the branches grow, just as your baby does. You can even name the shrub after baby and plant new ones with each new child you welcome. As they get older, they'll treasure the greenery that was planted they year they were born.